President Buhari has won re-election in Nigeria. Three days after presidential elections held on Feb. 23, results announced by INEC, Nigeria’s electoral commission, confirm president Muhammadu Buhari of the All Progressives Congress (APC) has been re-elected. Buhari fulfilled both criteria for winning the presidency, scoring a majority of the vote as well as over 25% of votes cast in 24 of Nigeria’s 36 states. Buhari defeated main challenger, former vice president Atiku Abubakar of the People’s Democratic Party (PDP) to emerge winner with 56% of the vote. For its part, PDP has already rejected the results, alleging electoral malpractice. As further proof of the dominance of APC and PDP, Nigeria’s two biggest political parties, third party candidates collectively won just over a million votes nationwide. INEC’s logistical shortcomings were first highlighted when it postponed the original presidential election date with just hours to polls opening on Feb. 16. Predictions the decision to postpone could impact voter turnout have been proved right with the presidential election in 2019 recording lower turnout than in 2015, despite a larger voter base. In fact, voter turnout in Lagos, Nigeria’s largest city and its economic nerve center, was a meager 18%. Overall, voter turnout among young Nigerians—a majority of the electorate—was also notably low. Ahead of his second term, Buhari’s campaign messaging has largely remained the same with promises to fight corruption, tackle insecurity and deliver economic growth. Under his watch, Boko Haram has been markedly weakened although claims that the terrorist sect has been defeated have proved untrue. Buhari’s anti-corruption fight has also claimed some major scalps, but critics say it has been largely one-sided and focused on opposition figures. 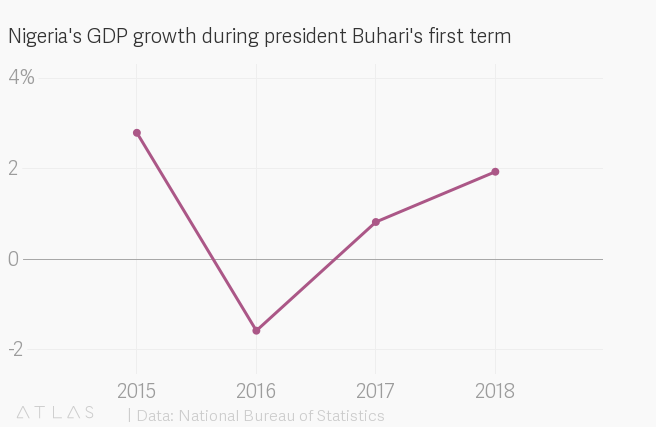 His handling of the economy has also been broadly criticized with his policies failing to deliver significant growth after an 15-month long recession. Indeed, Nigeria became the the poverty capital of the world last year and could be set to remain so given low human capital spending. Buhari’s victory also extends the long-running influence of Nigeria’s military on its national leadership. Should Buhari, 76, see out his second term, Nigeria will have been led for 46 of its 63 years after independence by military rulers or former military leaders. (Buhari himself first served as military head of state for 20 months between December 1983 and August 1985). Buhari’s health, a prominent campaign issue, will also be closely watched throughout his second term: the president was away on four medical trips to the UK during his first term, spending 150 days in London in 2017 alone treating an undisclosed illness.